Electric vehicles have received a lot of press over the past few months. This furore has even led some to suggest that EVs are more efficient than food powered humans riding bicycles. So we at Bristol Cycling have put together an unapologetically technical article in an attempt to shed some light on this. For starters, energy, whether it is petrol, electricity or food costs money. We are also burning our way through 2 billion years worth of accumulated energy reserves at a rate of knots. A by-product of this is CO2, NOx and other pollutants that we are all familiar with. Even the renewable fuel: food is taking its toll on the environment. The less energy we use, the fewer emissions we generate and the easier it will be to meet our demands using cleaner technologies. Using less energy also generally equates to less noise, reducing stress levels and smaller, lighter vehicles mean less damage to our roads and infrastructure, saving us all money. For absolute comparison, let’s assume a 10km journey, undertaken without stopping, on a flat stretch of road at a steady 30mph for cars and 12mph for bicycles. The working out is at the bottom of the article. The best selling car in the UK is the Nissan Qashqai. The power it needs to maintain 30mph with 1 passenger is around 5.5kW. However, because ICE are at best only 25% efficient, and at 30mph approximately 20% the total power is 26.5 kW (about the same as switching on 10 kettles). The total energy to travel 10km at this speed would be 5.5kWh, around half the average households daily electricity consumption, emitting 1271 grams of CO2. Filling this car with 4 persons and the total energy rises to 6.12 kWh, but per passenger, it is 1.53 kWh and 354 gCO2e. Carry out this same journey in a Tesla Model S and the raw power required to keep it moving at 30mph is actually higher, 7kW, due to the difference in weight (2250kg over the Nissans 1419kg). However, an electric motor is far more efficient than an ICE, converting around 90% of the energy put into it into motion. Total power to maintain 30mph is 7.8kW and total energy to undertake the journey is 1.61 kWh or 385 gCO2e. A significant saving over the ICE. A lone, 76.9 kg cyclist, sitting upright on a hefty 15 kg bicycle traveling at 12mph requires 0.092 kW to maintain this speed. Completing the full 10km needs 0.048 kWh of energy. However, our metabolism is not actually that efficient, reportedly as low as 25% (this is by no means hard fact and it is actually thought the fitter a person is the better they metabolise food into useful energy). Theoretically cycling 10km at 10mph would use 0.191 kWh, taking 25% as a worst case efficiency this would equal 164 kcal. Average EU food consumption is estimated at 1.44 gCO2e per kcal, equating to 236.8g for the full journey. Four people cycling separately could emit as much as 947 gCO2e. But although most commuting cyclists ride by themselves, so do most car drivers. It is unfair to compare a full car with lone cyclists. 4 cyclists traveling together would not ride 4 abreast, or spread out, but instead ride single file, with the 3 trailing riders drag energy reduced by around 27% for cyclists sitting upright and 23% when on the drops. Riding together even reduces the drag of the rider in front by 1.7%. Their energy consumption then falls to 160 Wh in total or 198 gCO2e. Swap their heavy bikes for a lightweight racer, with quality tyres, and the rider crouched on the drops emits a measly 81 gCO2e. Energy and emissions per person of a journey taken together, compared with the total when traveling by themselves. We should be clear that the notion that expending more energy means we consume more calories is also deeply flawed. An Office of National Statistics report found people consume 50% more than they think. With the majority of UK population either overweight or obese, it is obvious we are hardly meticulously balancing our fuel intake with consumption. A key figure missed off this calculation is the energy that goes into manufacturing and producing an ICE and EV. These are magnitudes greater than for a bicycle. A good breakdown of these figures is given in this report by Ricardo. They estimate 265 gCO2e/km for a ICE vehicle and 141 g/CO2e/km for an EV. 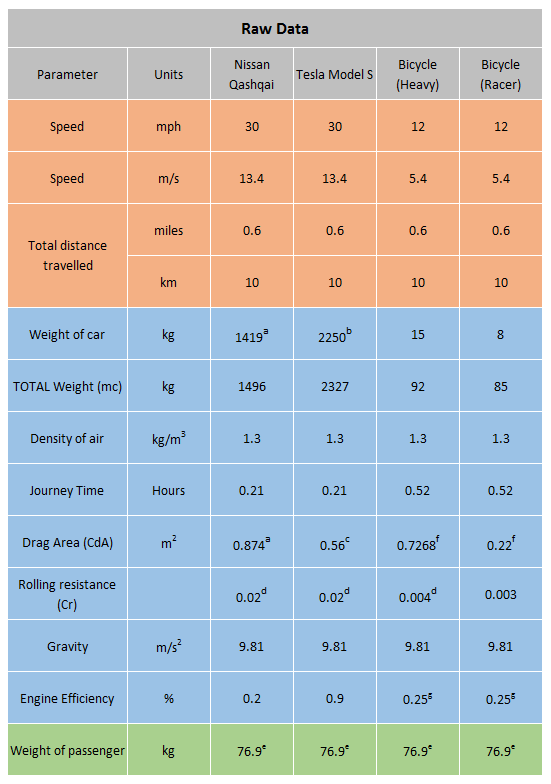 The European Cycling Federation estimates a bicycle at 21 gCO2e per passenger km and an electric bicycle 22 g. The figures for a 10 km trip are shown in the table below. Embodied energy, the associated CO2 emissions along with CO2 emissions of our food (let alone whether or not that food is consumed cycling or simply living) is a tricky business to calculate. Simple mechanics theory is far more robust and we urge anyone to hone in on the kWh figures we have calculated initially. Overall, the take-home message is that transportation doesn’t come much more inefficient than the ever larger ICE vehicles we have been duped into buying. EVs are a step in the right direction as far as the private car is concerned. They won’t, however, solve our congestion, health or space problems. *This article was updated on the 14th March to amend an error in cyclist drag when drafting and again on the 17th March to include a table for embodied energy.